Songs of the Frontier Warriors translated and presented by Robert Elsie and Janice Mathie-Heck with original text. Before writing there was song. Before texts recorded words as eternal statements, performers sang long and complex stories, following basic forms but extending and weaving their tales to suit the story to their audience. Most of these living performances were lost with the introduction of writing. Only a few areas of Europe maintained traditions of oral composition after the introduction of writing. One of these areas was found in the southwest Balkans; among the peoples who kept to the traditional ways of oral epic poetry were the Albanians. Robert Elsie and Janice Mathie-Heck present in this volume an epic cycle of the adventures of Mujo, a frontier warrior. Taken from recordings of traditional performers, this cycle represents a view of Albanian mountain life and beliefs that is hundreds if not thousands of years old. There is an Islamic air in these stories but with a deep pre Islamic, pre Christian underpinning. The different tales revolve around themes of courage and achievement and represent a preliterate style of entertainment. The poetry is lyrical; the stories are exciting; the background is fabulous. An interesting mixture of south European and Mideastern culture gives vivacity and excitement to the Songs of the Frontier Warriors. It’s a real treat to have the Albanian texts in hand. 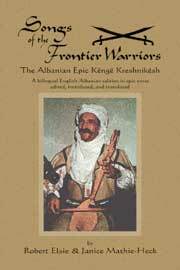 Songs of the frontier warriors = Këngë kreshnikësh; Albanian epic verse in a bilingual English-Albanian edition. Title main entry. Ed. and trans. by Robert Elsie and Janice Mathie- Heck. Bolchazy-Carducci Pub., ©2004 414 p. $39.00 (pa) Two Canadian scholars of Albanian literature present a selection of the best known cycle of Albanian epic verse in facing pages of Albanian and English. They explain that, being from a little-known culture and in a little-studied language, the cycle has tended to remain in the shadow of the Bosnian epic with which it has undeniable affinities. They include a short glossary without pronunciation guides.